If God is love, then why not share His love with others in a sweet way on Valentine’s Day? My recipe for Chocolate Dipped Shortbread Hearts from Special Teas by M. Dalton King might be one way to give your family, friends or a stranger a taste of His love. Cream butter. Add sugar gradually. Add flour, making sure it is well mixed, but don’t overwork. Pat out the dough on a lightly floured board until it is about ¾-inch thick. Using a 2-inch heart-shaped cookie cutter, cut out hearts and place on an ungreased cookie sheet. Cook 15 to 20 minutes or until cookies are golden brown on the edges. Watch the first few batches closely and lower oven to 350º F or 325º F if they cook too quickly. Place baked cookies on a rack to cool. Melt the chocolate in a microwave-proof container for about 45 seconds per square, depending on the oven. (If you don’t have a microwave oven, melt the chocolate in the top of a double boiler that has been coated with cooking spray until the chocolate liquidizes.) Dip half the heart into the melted chocolate so that you have a black and white effect. Lay dipped hearts on a plate covered with wax paper. Place plate in the refrigerator 1 hour or until chocolate has set. Store the hearts in a cool, dry container with sheets of wax paper between the layers. Undipped hearts can be frozen up to 2 months, providing they are well wrapped. *This article first appeared on Stitches Thru Time Writers. 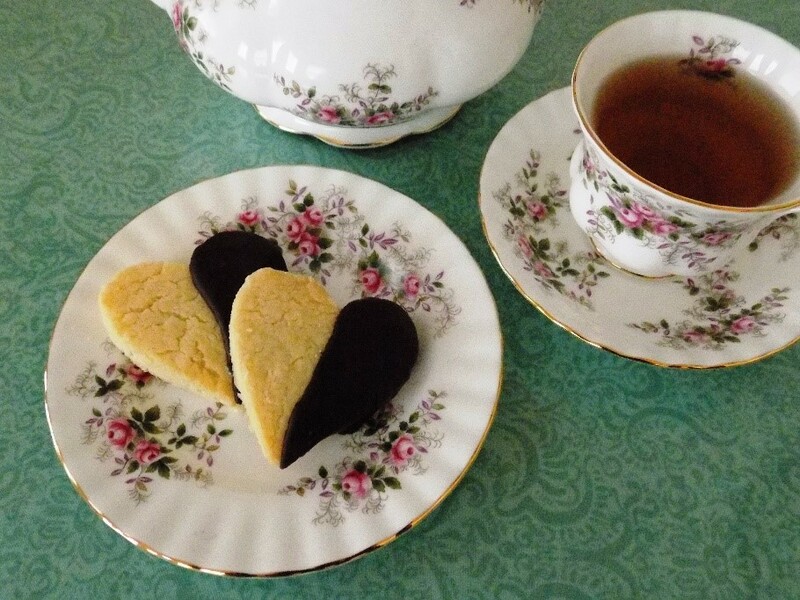 This entry was posted in Chocolate Dipped Shortbread Hearts, English recipes, Holidays, Recipes, Stitches Thru Time Writers, Valentine's Day and tagged Chocolate Dipped Shortbread Hearts, cookie recipe, Holidays, Special Teas by M. Dalton King, Stitches Thru Time Writers, Valentine's Day. Bookmark the permalink. So pretty! I hope we can share tea and cookies someday soon! Me too! Wouldn’t that be lovely?